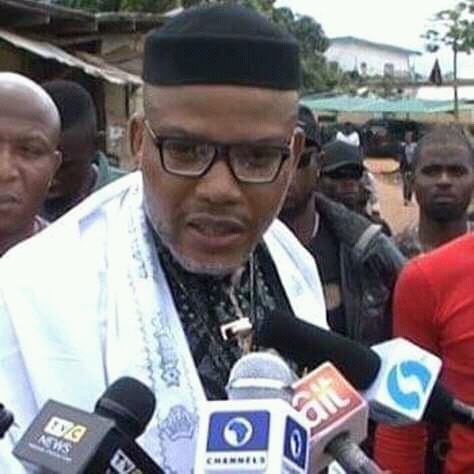 According to a report gathered by Gbam TV has it that Mazi Nnamdi Kanu the leader of IPOB has insisted once more partaining the boycott of all election called upon in Nigeria federation with the exceptional of Abia/Ebonyi which he sounded clearly to the world that those frustrated Leaders must have no other option than to leave office with the Almighty power of IPOB Members. According to his claims, Below are the Few questions directed to Nnamdi Kanu in Israel:::: on how The the governors that are bent on killing innocent Biafrans will be removed from office hence They don't have PVC to accomplish it. Q: Are we to vote in Ebonyi state or abia? "I said no, they want me to tell them how we'll remove them on air but I won't expose it. When the time comes I will tell you", He said. Q: People are saying that our leader said should we vote out okezie Ikpeazu or governor of ebonyi? "When the time comes you will know, but we shall remove them from office. Also we shall boycott all election.... Starting from the presidential election 16th February, 2019. Just sit at home and enjoy yourself with ofeukazi. Those with PVC and those without PVC are all IPOB, lockdown the whole of Biafra land so that the world will know that we are serious", Nnamdi Kanu Said. Amidst all, it's obvious that IPOB Family Worldwide still stands on Election boycott across Nigeria following the upcoming presidential election on 16th February, 2019. You can now order Dangote cement in units or truck loads and get it delivered to your preferred door-step or construction site which is far better than driving from one depot or dealers shop to another.Distributing directly from The main Factory to all parts of the country to Sub- distributors, Wholesalers, Retailers and End- users at a promo price of N1,3OO per Bag of Cement and N1O,OOO per 5OKG bag of RICE. Delivery is guaranteed within 48HRS after booking. Contact The Marketing Manager (Jubril Abubakar) on O7O166O706O FOR BOOKINGS AND ENQUIRIES.